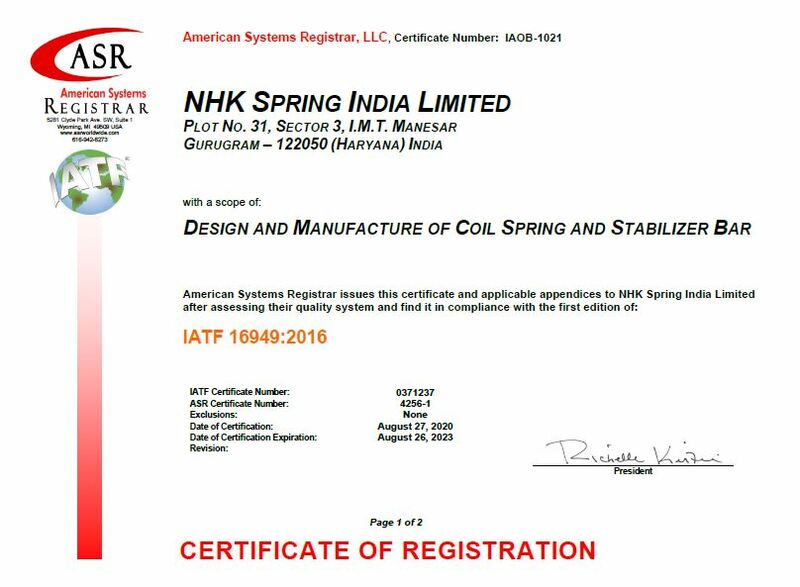 NHK Spring India Ltd., is striving for ever higher levels of quality with manufacturing that puts priority on quality from engineering to production. We are committed to the satisfaction of customers. Achieve leadership in all spheres of working. Create a positive working environment & strive for continual growth and improvement. Identify & fulfill the requirements of interested parties. Customer satisfaction, through reduction in customer complaints, identifying customer needs. Technology upgradation, through continuous improvement under the guidance of experts from NHK, Japan. Employee satisfaction, by creating suitable working environment, which includes teamwork, motivation, training, education, safety and employees involvement. Leadership, by capturing maximum market share. Care for environment, by paying attention to pollution, effluent disposal and adhering to basic needs of green earth. Kindly click on the snapshots above to view bigger image of the certificate.